Alexander Stille is a professor of international journalism at Columbia. Inequality has traditionally been acceptable to Americans if accompanied by mobility. But most recent studies of economic mobility indicate that it is getting even harder for people to jump from one economic class to another in the United States, harder to join the elite. While Americans are used to considering equal opportunity and equality of condition as separate issues, they may need to reconsider. In an era in which money translates into political power, there is a growing feeling, on both left and right, that special interests have their way in Washington. There is growing anger, from the Tea Party to Occupy Wall Street, that the current system is stacked against ordinary citizens. Suddenly, as in the 1930s, the issue of economic equality is back in play. Questionable approach, this one is from CNBC. Typically includes households with incomes above $46,326 (all households) or $67,348 (dual; earners households) per year. In order for two earners family to qualify each earner should get approximately $34K a year or more. While it is true that for politicians middle class are people who are voting for him/her, a pretty realistic definition is "above average" with the average family income for the region as cut off on one side and, say, 20% the richest on the other. So those are people who have per family income between average and income of 20% percentile. What is the middle class, anyway? There's no official definition, but Americans and their leaders seem to know it when they see it. And after five tough years of a recession and slow economy, there's plenty of evidence that fewer people see a middle-class life when they look in the mirror. "You can't define middle class, but you can ask people, 'Do you still feel middle class?' And more and more people don't," said Tim Smeeding, director of the Institute for Research on Poverty at the University of Wisconsin. Still, as election season heats up, that's not stopping many politicians from promising to help the middle class, whoever they may be. "The whole attraction of middle class … is it doesn't mean anything," said Dennis Gilbert, a sociology professor at Hamilton College who studies class issues. "Middle class means anybody who might vote for you." The focus on the middle class starts at the top of the ticket, where President Barack Obama and Republican challenger Mitt Romney have both repeatedly invoked the middle class in their quest to win the presidency next month. Obama told voters during last week's debate that he cut taxes for middle-class families "because I believe that we do best when the middle class is doing well." Then he questioned whether Romney had the same dedication to the middle class. "And at some point, I think the American people have to ask themselves, is the reason that Governor Romney is keeping all these plans to replace secret because they're too good? Is it -- is it because that somehow middle-class families are going to benefit too much from them?" Obama said, according to a transcript provided by the Commission on Presidential Debates. Romney argued that Obama's policies have hurt the middle class and would continue to do so. "There's no question in my mind that if the president were to be re-elected you'll continue to see a middle-class squeeze with incomes going down and prices going up," he said during the debate. "I'll get incomes up again." The traditional political focus on the middle class comes as fewer people feel like they're still part of it. A Pew Research Center report this year found that 49 percent of people define themselves as middle class, down from 53 percent from four years ago. "Statistically, that's a significant shift, but beyond statistics it feels right," said Rich Morin, a senior editor with Pew Research Center. "It's been a tough four years." In fact, Morin said, Americans' sense of how the middle part of the economic spectrum is doing is surprisingly accurate. The polling data on whether Americans feel like they are still part of the middle class matches well with the researchers' economic data on median income in the United States, which has fallen in recent years after adjusting for inflation. Still, experts say the term middle class has a cultural connotation that goes beyond the number on your paycheck or tax stub. Kevin Leicht, director of the Iowa Social Science Research Center at the University of Iowa, said many Americans think of a middle-class life as being one in which you have a stable job, own your own home and occasionally buy something substantial like a new car. You also either went to college or have the aspiration of sending your children to college. Beyond that, he said, the term middle class invokes the type of person who gets married and has kids, pays their bills on time, doesn't get in trouble with the law and maybe goes to church. "In the United States, it's probably more of a cultural category than an economic one," he said. He thinks Americans' affinity for the middle class also comes partly from a natural suspicion for both the richest and the poorest Americans. Audacious wealth has traditionally been frowned upon in this country, he said, while there's also often a fear-based bias against people who are poor. "Because a lot of us are two missed paychecks away from being in exactly the same position, we have to act like there's something systematically wrong with people who are in that position," Leicht said. The sense of a shrinking middle class also comes amid evidence that the rich are getting richer and the poor are getting poorer, discouraging many Americans. "They are aware that economic inequality is growing. And a majority - a substantial majority - say it's a bad thing," Morin said. "Everyone aspires to be upper class, but people are aware that as more Americans move up into the upper class, more Americans are moving down, and that's not a good thing." The big question now is whether Americans' discouraged attitudes about the middle class will change if the economic recovery starts to pick up. In general, experts say that history would show that Americans will grow more optimistic about the middle class, and the American dream, as economic conditions improve. But, they note, this recession and weak recovery has been different from any other we've experienced in recent decades, and the future remains uncertain. "I'm sure a strong recovery would help, but that's a ways off," Smeeding said. "Our standard of living is lower now than it was in 2006." IT'S a puzzle: one dispossessed group after another - blacks, women, Hispanics and gays - has been gradually accepted in the United States, granted equal rights and brought into the mainstream. The United States prides itself on the belief that "anyone can be president," and what better example than Barack Obama, son of a black Kenyan immigrant and a white American mother - neither of them rich. It's a surprising contradiction. Is the confluence of these two movements a mere historical accident? Or are the two trends related? European countries have done a better job of protecting workers' salaries and rights but have been reluctant to extend the benefits of their generous welfare state to new immigrants who look and act differently from them. Could America's lost enthusiasm for income redistribution and progressive taxation be in part a reaction to sharing resources with traditionally excluded groups? "I do think there is a trade-off between inclusion and equality," said Gary Becker, a professor of economics at the University of Chicago and a Nobel laureate. "I think if you are a German worker you are better off than your American equivalent, but if you are an immigrant, you are better off in the U.S."
PROFESSOR Becker, a celebrated free-market conservative, wrote his Ph.D. dissertation (and first book, "The Economics of Discrimination") to demonstrate that racial discrimination was economically inefficient. American business leaders seem to have learned that there is no money to be made in exclusion: bringing in each new group has simply created new consumers to court. If you can capture nearly three-quarters of the economy's growth - as the top 1 percent did between 2002 and 2006 - it may not be worth worrying about gay marriage or skin color. "I think we have become more meritocratic - educational attainment has become increasingly predictive of economic success," Professor Becker said. But with educational attainment going increasingly to the children of the affluent and educated, we appear to be developing a self-perpetuating elite that reaps a greater and greater share of financial rewards. It is a hard-working elite, and more diverse than the old white male Anglo-Saxon establishment - but nonetheless claims a larger share of the national income than was the case 50 years ago, when blacks, Jews and women were largely shut out of powerful institutions. Inequality and inclusion are both as American as apple pie, says Jerome Karabel, a professor of sociology at the University of California, Berkeley, and author of "The Chosen," about the history of admission to Harvard, Yale and Princeton. "I don't think any advanced democracy is as obsessed with equality of opportunity or as relatively unconcerned with equality of condition," he says. "As long as everyone has a chance to compete, we shouldn't worry about equality. Equality of condition is seen as undesirable, even un-American." The long history of racial discrimination represented an embarrassing contradiction - and a serious threat - to our national story of equal opportunity. With Jim Crow laws firmly in place it was hard to seriously argue that everyone had an equal chance. Civil rights leaders like the Rev. Dr. Martin Luther King Jr. were able to use this tradition to draw support to their causes. "Given our culture of equality of opportunity, these kinds of rights-based arguments are almost impossible to refute," Professor Karabel said. "Even in today's conservative political climate, opponents of gay rights are losing ground." The removal of traditional barriers opened up the American system. In 1951 blacks made up less than 1 percent of the students at America's Ivy League colleges. Today they make up about 8 percent. At the same time, America's elite universities are increasingly the provinces of the well-to-do. "Looking at the data, you see that the freshman class of our top colleges are more and more made up of the children of upper- and upper-middle-class families," said Thomas J. Espenshade of Princeton, a sociologist. Shamus Khan, a sociologist at Columbia and the author of "Privilege," a book about St. Paul's, the prep school, agreed that there had been a change in the composition of the elite. "Who is at elite schools seems to have shifted," he said. "But the elite seem to have a firmer and firmer hold on our nation's wealth and power." "After the immigration reform of 1965, this country went from being the United States of Europe to being the United States of the World. All with virtually no violence and comparatively little trauma," Professor Karabel said. This is no small thing, particularly when you compare it to the trauma experienced by many European societies in absorbing much lower percentages of foreign-born citizens, few of whom have penetrated their countries' elites. Moreover, inequality has grown partly for reasons that have little or nothing to do with inclusion. Almost all advanced industrial societies - even Sweden - have become more unequal. But the United States has become considerably more unequal. In Europe, the rights of labor have remained more central, while the United States has seen the rise of identity politics. "There is much less class-based organization in the U.S," said Professor Karabel. "Race, gender and sexual orientation became the salient cleavages of American political life. And if you look at it - blacks, Hispanics and women have gained somewhat relative to the population as a whole, but labor as a category has lost ground. The groups that mobilized - blacks, Hispanics, women - made gains. But white male workers, who demobilized politically, lost ground." One of the groups to become mobilized in response to the protest movements of the 1960s and early 1970s was the rich. Think tanks dedicated to defending the free-enterprise system - such as the Cato Institute and the Heritage Foundation - were born in this period. And it is not an accident that the right-wing advocate Glenn Beck held a national rally on the anniversary of King's "I Have a Dream" speech in front of the Lincoln Memorial. Republicans now defend tax cuts for the richest 2 percent using arguments and language from the civil rights movements: insisting that excluding the richest earners is unfair. Removing the most blatant forms of discrimination, ironically, made it easier to justify keeping whatever rewards you could obtain through the new, supposedly more meritocratic system. "Greater inclusiveness was a precondition for greater economic stratification," said Professor Karabel. "It strengthened the system, reinvigorated its ideology - it is much easier to defend gains that appear to be earned through merit. In a meritocracy, inequality becomes much more acceptable." THE term "meritocracy" - now almost universally used as a term of praise - was actually coined as a pejorative term, appearing for the first time in 1958, in the title of a satirical dystopian novel, "The Rise of the Meritocracy," by the British Labour Party leader Michael Young. He warned against the creation of a new technocratic elite in which the selection of the few would lead to the abandonment of the many, a new elite whose privileges were even more crushing and fiercely defended because they appeared to be entirely merited. Of the European countries, Britain's politics of inequality and inclusion most resemble those of the United States. Even as inequality has grown considerably, the British sense of economic class has diminished. As recently as 1988, some 67 percent of British citizens proudly identified themselves as working class. Now only 24 percent do. Almost everybody below the Queen and above the poverty line considers himself or herself "middle class." Germany still has robust protections for its workers and one of the healthiest economies in Europe. Children at age 10 are placed on different tracks, some leading to university and others to vocational school - a closing off of opportunity that Americans would find intolerable. But it is uncontroversial because those attending vocational school often earn as much as those who attend university. In France, it is illegal for the government to collect information on people on the basis of race. And yet millions of immigrants - and the children and grandchildren of immigrants - fester in slums. In the United States, the stratification of wealth followed several decades where economic equality was strong. The stock market crash of 1929 and the Great Depression that followed underscored the excesses of the roaring '20s and ushered in an era in which the political climate favored labor unions, progressive taxation and social programs aimed at reducing poverty. Rhetoric like this makes the very rich feel very sad. It has sent them on a crusade to restore matters to their rightful place. And in the process they have developed one of the distinctive literary forms of our time: the plutocrat's j'accuse. The most famous example is the open letter to the president written last year by the hedge fund manager Leon Cooperman and dissected at length in this week's New Yorker magazine. In it, Mr. Cooperman blames Mr. Obama (and his "minions") for "setting the tenor of the rancorous debate now roiling us that smacks of what so many have characterized as 'class warfare.' " This is serious, this roiling and this tenor-setting, but it is not the only damage the president's words have done. The "divisive, polarizing tone of your rhetoric is cleaving a widening gulf," Mr. Cooperman continued, "between the downtrodden and those best positioned to help them" - meaning, apparently, hedge fund managers like himself. Other princelings who have made noteworthy contributions to the genre include Ted Leonsis, the owner of several Washington sports teams, who feels that "anyone who has achieved success in terms of rank or fiscal success is being cast as a bad guy in a black hat," and the casino magnate Steve Wynn, who griped in a famous conference call that the president "keeps making speeches about redistribution." He said, "We haven't heard that kind of talk except from pure socialists." Reports have even reached us, via The Wall Street Journal, of a tragic incident last year on the streets of New York in which an unnamed "panhandler" rejected a handout with a spiteful, "You Wall Street fat cats!" Thankfully, the man at whom this imprecation was directed, the chief executive of a venture capital firm, knew whom to blame: President Obama, whose "incendiary message has now reached the streets." Nobody likes to be criticized, but one would expect captains of industry, Darwinian tough guys that they are, to have thicker skins. Were Mr. Obama a true incendiary, he might have found a way on Wednesday to mention his opponent's millions; his work for Bain Capital; or his dismissal, captured on video, of those layabouts who make up 47 percent of the country. Mr. Obama called for ending the tax break for corporate jets, sure, but that's about it. In the broad scheme of things, these are excellent times to be a billionaire. Labor is powerless. Taxes are low. The banks that survived the crisis are bigger than ever. So why do the well-to-do whine so? Why do they wring their hands? For one thing, their criticisms reveal a contemptuous view of their fellow citizens. That all the books and articles on the financial crisis and the recession might have had an effect - that people might see the economic downturn as a reflection on the individuals who were, a few years back, lionized as the economy's leaders - is inconceivable to the class-war complainers. The public's attitude, they seem to believe, can have arisen only as a result of propagandizing by Mr. Obama. No American would ever stop respecting his betters unless he was brainwashed into it. It is also a play for legitimacy. In good times, the very rich compare themselves to the Almighty; in hard times they convince themselves that Huey P. Long lurks just around the corner. History, they fear, will repeat its most sordid chapters unless it is stopped right now, and that's why they act as if a few mean words wound as hurtfully as any program of, say, antitrust enforcement. They whine because whining works. One only wishes that if he wins a second term, Barack Obama will give them something to really cry about. "Noah and his brother George inherited from their pioneer father six hundred acres of farmland, land as dark and rich as chocolate cake, and a small saw factory that was nearly bankrupt. War came. George raised a rifle company, marched away at its head. Noah hired a village idiot to fight in his place, converted the saw factory to the manufacture of swords and bayonets, converted the farm to the raising of hogs. Abraham Lincoln declared that no amount of money was too much to pay for the restoration of the Union, so Noah priced his merchandise in scale with the national tragedy. And he made this discovery: Government objections to the price or quality of his wares could be vaporized with bribes that were pitifully small. He married Cleota Herrick, the ugliest woman in Indiana, because she had four hundred thousand dollars. With her money he expanded the factory and bought more farms, all in Rosewater County. He became the largest individual hog farmer in the North. And, in order not to be victimized by meat packers, he bought controlling interest in an Indianapolis slaughterhouse. In order not to be victimized by steel suppliers, he bought controlling interest in a steel company in Pittsburgh. In order not to be victimized by coal suppliers, he bought controlling interest in several mines. In order not to be victimized by money lenders, he founded a bank. Thus did a handful of rapacious citizens come to control all that was worth controlling in America. Thus was the savage and stupid and entirely inappropriate and unnecessary and humorless American class system created. Honest, industrious, peaceful citizens were classed as bloodsuckers, if they asked to be paid a living wage. And they saw that praise was reserved henceforth for those who devised means of getting paid enormously for committing crimes against which no laws had been passed. Thus the American dream turned belly up, turned green, bobbed to the scummy surface of cupidity unlimited, filled with gas, went bang in the noonday sun. E pluribus unum is surely an ironic motto to inscribe on the currency of this Utopia gone bust, for every grotesquely rich American represents property, privileges, and pleasures that have been denied the many. An even more instructive motto, in the light of history made by the Noah Rosewaters, might be: Grab much too much, or you'll get nothing at all. And Noah begat Samuel, who married Geraldine Ames Rockefeller. Samuel became even more interested in politics than his father had been, served the Republican Party tirelessly as a kingmaker, caused that party to nominate men who would whirl like dervishes, bawl fluent Babylonian, and order the militia to fire into crowds whenever a poor man seemed on the point of suggesting that he and a Rosewater were equal in the eyes of the law. And Samuel bought newspapers, and preachers, too. He gave them this simple lesson to teach, and they taught it well: Anybody who thought that the United States of America was supposed to be a Utopia was a piggy, lazy, God-damned fool. Samuel thundered that no American factory hand was worth more than eighty cents a day. And yet he could be thankful for the opportunity to pay a hundred thousand dollars or more for a painting by an Italian three centuries dead. And he capped this insult by giving paintings to museums for the spiritual elevation of the poor. The museums were closed on Sundays..."
We define a bad job as one that pays less than $37,000 per year (in inflation-adjusted 2010 dollars); lacks employer-provided health insurance; and has no employer-sponsored retirement plan. By our calculations, about 24 percent of U.S. workers were in a bad job in 2010 (the most recently available data). The share of bad jobs in the economy is substantially higher than it was in 1979, when 18 percent of workers were in a bad job by the same definition. The problems we identify here are long-term and largely unrelated to the Great Recession. Most of the increase in bad jobs – to 22 percent in 2007 – occurred before the recession and subsequent weak recovery. Of the three criteria we use, workers did best with respect to earnings. Overall, in 2010, about 53 percent of workers were in jobs that paid less than $37,000 per year, down from 59 percent in 1979. A decline in health-insurance coverage, however, was a major driver of the increase in bad jobs. About 47 percent of workers did not have employer-provided health insurance in 2010, up from 30 percent in 1979. A deterioration in retirement-plan coverage also contributed to the rise in bad jobs. In 2010, about 55 percent of workers did not participate in a retirement plan at work, up from 48 percent in 1979. The increase in bad jobs took place despite a substantial increase in the productive capacity of the U.S. economy over the same period. The typical worker in 2010 was seven years older than in 1979. In 2010, over one-third of US workers had a four-year college degree or more, up from just one-fifth in 1979. On average, workers today also work with more physical capital (plants, machinery, equipment, etc.) and much more sophisticated technology. Given that older and better-educated workers generally receive higher pay and better benefits, we would have expected the share of bad jobs to have declined over the last three decades in step with these improvements in the quality of the workforce. Between 1979 and 2010, the share of workers with bad jobs, increased for workers at every education level. Workers with less than a high school degree, only a high school degree, and even those with some college (including associates degrees) were substantially more likely to be in a bad job in 2010 than they were in 1979. Even among workers with a four-year college degree or more, the share of workers in a bad job was slightly higher in 2010 than it had been three decades earlier. ...parental wealth plays an important role in whether children move up or down the socioeconomic ladder in adulthood. And that parental wealth has an influence above and beyond the three factors that sociologists and economists have traditionally considered in research on social mobility-parental education, income, and occupation. "Wealth not only fulfills a purchasing function, allowing families to buy homes in good neighborhoods and send their children to costly schools and colleges, for example, but it also has an insurance function, offering a sort of private safety net that gives children a very different set of choices as they enter the adult world," Pfeffer said. Exceptional upward mobility in the US is a myth, EurekAlert: The rhetoric is relentless: America is a place of unparalleled opportunity, where hard work and determination can propel a child out of humble beginnings into the White House, or at least a mansion on a hill. But the reality is very different, according to a University of Michigan researcher who is studying inequality across generations around the world. "Especially in the United States, people underestimate the extent to which your destiny is linked to your background. Research shows that it's really a myth that the U.S. is a land of exceptional social mobility," said Fabian Pfeffer, a sociologist at the U-M Institute for Social Research and the organizer of an international conference on inequality across multiple generations being held ... in Ann Arbor. Pfeffer's own research illustrates this point based on data on two generations of families in the U.S. and a comparison of his findings to similar data from Germany and Sweden. ... He found that parental wealth plays an important role in whether children move up or down the socioeconomic ladder in adulthood. And that parental wealth has an influence above and beyond the three factors that sociologists and economists have traditionally considered in research on social mobility-parental education, income, and occupation. "Wealth not only fulfills a purchasing function, allowing families to buy homes in good neighborhoods and send their children to costly schools and colleges, for example, but it also has an insurance function, offering a sort of private safety net that gives children a very different set of choices as they enter the adult world," Pfeffer said. Keep in mind that "wealth" is essentially the ability to mobilize and direct the effort of other people. What you can build or harvest unaided is really very limited, and what you can set aside for later of what you build unaided is limited in amount and always at risk (say, from bears or fungus or the vagaries of weather.) Things loosen up a lot as the population of workers and builders rises, with surpluses in production becoming the norm and storage of excess becoming much easier. What the fabulously wealthy have, and why we should be annoyed at them, is the ability to muster our efforts towards their well-being, at the expense of our own. The other side of this coin... People at the bottom are decreasing in "social" value... because their pay is stagnating. They are losing wealth and economic power in their communities. Yes, they are not going up, but they are being slid downward too. In the sixties the country was rich. Many working class men and women put themselves thru college on a combination of scholarships, after school and summer earnings, and federal grant programs of the Great Society. And college was cheap enough that those funds generally sufficed. Loan programs were comparatively modest, and if you took out a loan its burden was further lightened by the inflation of the 70s. The country no longer bestrides the world as it did then. College is much more expensive and manual labor, restaurant work, and types of work we worked our way thru school with, are much less available to today's students and even for those able to work them, those jobs do not pay nearly enough to cover undergrad costs. In the late 1960s tuition at Northwestern worked its way up to $2200/year by '69 if memory serves right. A construction unskilled labor job or a vacation replacement job in the steel mills could give you 500 hours at $4/hr. Some jobs better, some a little worse. No way a student today can earn $50,000 working an unskilled labor job in the summer. The rich could always provide opportunities for their own. The barriers to advancement thru education for ambitious bright children of today's lower middle class are far higher and continue to grow. Today's college professors live in much better style than the threadbare gentility of my professors and the colleges are far better appointed and more richly administered than in the sixties. Part of the cost has been opportunity for the ambitious working class boy or girl. Federal grants seem harder to get. Financially unsophisticated people are sold costly student loans as the best available deal. These indenture the students to the banks. Since the banks run the country regardless of who is in office in DC, this exploitation of the poor by the rich is unlikely to change anytime soon. "We study the role of parental wealth for children's educational and occupational outcomes across three types of welfare states and outline a theoretical model that assumes parental wealth to impact offspring's attainment through two mechanisms, wealth's purchasing function and its insurance function. We argue that welfare states can limit the purchasing function of wealth, for instance by providing free education and generous social benefits, yet none of the welfare states examined here provides a functional equivalent to the insurance against adverse outcomes afforded by parental wealth. Our empirical evidence of substantial associations between parental wealth and children's educational success and social mobility in three nations that are marked by large institutional differences is in line with this interpretation and helps us re-examine and extend existing typologies of mobility regimes." One final note: Despite the overwhelming data, some people dispute that the middle class has been struggling or that they have suffered any sort of set back in income or purchasing power. The Brookings Institution's Scott Winship maintains that "conventional accounts of how the broad middle is doing systematically overstate economic insecurity." If one wants to argue exactly how far the Middle Class has fallen behind, and make the claim that the MSM has overstated it, well, that is a legitimate debate. I think its a losing argument, but, hey, its hardly incredible to say conventional wisdom overstates something. On the other hand, the American Enterprise Institute fallaciously makes the less than credible or honest claim that there has been "considerable improvement in material well-being for both the middle class and the poor … over the past three decades." This is the sort of statement that you expect from a group that has given up any pretense towards reality. The AEI has moved from intellectually bankrupt to utterly dishonest, and I assume anything I read from them, on any subject, are willful lies, misinformation and propaganda. As an asset manager, I cannot risk falling into an alternative universe that diverges form reality. That is the sand box AEI plays in. As such, I have been forced to SEQUESTER their nonsense, as their detachment from the real world is an expensive and potentially dangerous money loser for anyone who reads their foolishness. I mostly ignore their idiocy, and suggest you do the same. WTF?! Dude, we warned you about that brown acid. As numerous economists have pointed out, the decline of the middle classes in the US is a direct consequence of increasing rent seeking by the rich, who are also paying a record low level of taxes. In the 19th century and early 20th century, most Americans were what they then called working class, just getting by on a paycheck, renting, owning little and with few prospects for their children. The middle class existed as the "business class", but this was a small group of business owners and better paid, better educated employees. The middle class started to grow under FDR, but it didn't become central until after WWII when the government made a concerted effort of education, bonuses, guaranteed loans, grants, pro-union policies and so on, backed by extremely high progressive tax rates. If you go back to 1912, there was only a tiny middle class. If you go back to the 1930s, there was a growing middle class. If you go back to the 1950s through 1970s, most Americans were middle class. The middle class was created by the government, as it has been in every society to date. Sorry I thought it was a funny analogy for saying exactly what you've posted statistics to show... The middle class have picked up the slack for funding government expansion. I'll refrain from vague analogies in the future.. The middle class 'picked up the slack' because the wealthy dropped it. to R... Again, it is not taxes that have caused this decline, it is wages remaining flat or declining as the rentiers (management and investors) have seized an ever increasing portion the value of workers' labor. The fact that the rich have defaulted on their patriotic and civic duty to pay their share just compounds the injury. to DrDick... You shouldn't abuse the term rentier. Rent is income not due to labor or capital (which is stored labor). Mere savers/investors are not normally rentiers, though they are currently to the extent they profited from the bailouts. Had the right thing been done during the crisis (let the bondholders of Citibank et al take a haircut) all the financial system rent profits for the past 2 decades would have been vaporized instantly. Very few of those you list (none except intellectual property owners, and not necessarily all of them) are actual rentiers. A rentier, in the original Marxist sense, is someone who gains a living through ownership of property rather than labor. Interest, profits, and other capital gains are indeed rents, as all unearned income. Wages, except those for executives who largely set their own compensation and the like, are by definition not rents. Yes, rent originates from the concept of receiving pay due to ownership rather than labour (e.g I get paid even if I don't do anything). Revelo attempts to excuse this by claiming that capital is a lump of 'owed' labour. His absurd argument is instantly revealed by the existence of 'inheritance'. All rents are artificial. Your so-called "natural" rents can only be extracted because the government enforces property rights and contracts. As your blinders seem to allow you only to see overpaid workers, you overlooked a primary form of rent extraction, charging rent on money, which is the privilege of those owning and/or minting the money (banks). That in turn is also all based on government license, property/contract enforcement, and policies allowing a small sector of business to control most flows of money. And 'overpaid' as according to a selective version of Lord God Market at that. Revelo doesn't even show the prudence to invoke the always incalculable 'Marginal Utility'. Even most "entrepreneurs" who have to loan the seed money for their business, are essentially working for the man, i.e. their creditor, who extracts a good part of the fruits of their labor, and often requires being given a say in business decisions, sometimes to a dominating extent. That's a common experience of tech startup founders. Many are walking away with what amounts to a more or less generous salary for a few years of hard work, unless the business becomes spectacularly successful and they have negotiated terms that leave them with a good chunk of the gains. Land ownership is not natural. It is a government service. Telecom spectrum is not natural. The exclusive right to use a frequency range is a government service. In fact, private property is a government service. There's no point in being mystical. This isn't Star Wars with "the force". Earlier I mentioned this in passing, but now again. In my humble opinion, the series "The Wire" (Wire) - this is the best source of information for those who want to get an idea of the reality of urban life in America, the beginning of XXI century. For those who have not heard about this film, "The Wire" - is an epic television series cable network HBO, telling about the drug trade in Baltimore and all the people who are involved in it (and it is - the police, prosecutors, hired killers, lawyers as well as street vendors). The idea of the series, its characters and the storyline is so detailed and confusing, it looks more like a novel, rather than on a standard TV show. In it one little whiny and cloying sentimentality that has spread throughout the American television. Although insight into this series makes it impossible to clearly sort through what is what, his general idea is that large bureaucratic institutions inevitably suffer from the dysfunction and corruption. It is particularly appropriate quote from a movie. In explaining why he intended to testify against a particularly cruel sadist-gangster, a long-term drug mafia soldier said to the police investigator: "This game is rigged, man." A special expressiveness and style, this phrase is no different, but it is - an extremely informative and concise summary of the problems faced by industrialized countries, and America - in particular. In the end, what a scandal with LIBOR, if not rigged game? After all, rich and powerful play it on a completely different set of rules to be materially different from the rules of a small and simple man. List of news showing that the "rigged game" is increasing every day, but the last two events deserve special comment. First news - a new study that shows that the global super-elite (it is a percentage of the top 1 percent of the company) put by $ 20 trillion in offshore tax havens, from where this money can not be deleted. Yes, you read correctly. Twenty trillion dollars, more than the combined GDP of the United States and Japan. The author of this shocking study, James Henry (James Henry) - this is not some fire-breathing radical or a disgruntled resident of the teaching departments. No, he - a former chief economist at McKinsey (well known for its links and a very successful consulting firm of Management). Considering how well employees are McKinsey, Henry, for sure, and he enters this world-wide 1 percent. In his study, he said that the yawning gap between rich and poor - much wider than indicated in even the most pessimistic estimates. Investigation of the author shows that at least 100,000 people own assets worth about 10 trillion dollars. To submit to the absurdity of this situation, imagine that the population of Scranton in Pennsylvania, owns all the wealth of the countries of Central and South America. Other news - the recent publication of the book of the former federal prosecutor Neil Barofski (Neil Barofsky), which is responsible for the supervision and control over the government's program to rescue troubled assets. Under this program, at the height of the financial crisis, the government bought the assets of troubled U.S. banks. The book was Barofski cause huge scandal because it is an endless list of corruption that swept the regulatory system in the country. It should be noted that Barofski does not detail the actual facts of violation of the law, but his story is much more alarming. The problem is not that the system applies the rules selectively and imperfectly, and that these rules and the system itself completely ineffective and frankly immoral. The invasion of foreign banks in the ownership and poaching in the leadership ranks of such regulatory bodies should be considered illegal. But do not count. It is also illegal to be enriched at the expense of federal officials a good knowledge of the process of enforcement. But it is not. Thus, there is - the constant movement to and fro in the upper echelons of Wall Street and the state. And the only noticeable effect of this movement - is further weakening the already feeble enforcement mechanisms. Sam Barofski not directly quoted, "The Wire," but he comes very close to this when he says: "The suspicion is justified that the system is rigged for the benefit of the largest banks and the elite, so that they operate under their own rules at the expense of taxpayers that finance provided by banks such assistance. " Like the author I mentioned study Barofski - is not some effete left-wing community organizer or a disgruntled radical. No, he is a graduate of the University of the Ivy League, a former federal prosecutor, has earned its reputation for professional presentation of the prosecution and sentencing for the largest narcotic case in U.S. history. I'm smart enough to realize how incredibly (almost indescribable) I was lucky: my parents gave me the best education he could have imagined. I was happy with an order that a very early age socialized with offspring of the rich and powerful. But even in a place like Harvard, who fancies himself as one of the most meritocratic institutions in the world, and (supposly) take students only based thier talents and abilities, it is impossible not to notice that the game is rigged beyond measure. Almost everyone was admitted by the university in the end lives a quite comfortable and financially prosperous life. I am not in any case not beg for sympathy and not trying to appear in the image of a martyr. But those who succeeds, who gets the best jobs, best graduate school in the fall, becomes the owner of the largest houses -- is largely not hard-working and highly mobile members of the middle or lower class. No, this is - the offspring of the elite. There is a deep sense of disappointment when you see the fallacy and the fallacy of a typical American sermons on the remuneration of hard work and perseverance. But facts are facts, but reality is reality. I personally have seen endless examples of how careless and apathetic rich kids (got to college, thanks to their parents, and for four years of study are not distinguished by special achievements) can easily fall on the well-paid positions, while their fellow students with a much more impressive summary of the level of training and worried endlessly about their student loans for school and medical bills (even though these concerns seem strange and bourgeois to those who can not find a job, buy an apartment or even a medical insurance policy). When people like Neil Barofski and James Henry, who by virtue of their education and jobs, it would seem, have staunchly defend the system, begin to criticize it severely, you realize that something is fundamentally wrong. Over time, a more or less reasonable balance is achieved, and I honestly do not see how the status quo can be preserved for a long time. But the shocking disparities of wealth and power between the different people that are now characteristic of Western democracies must be a sobering example for those Russians who want their country to become more representative and transparent. This is a very tough fight, and the elite have always relied on the cynicism and indifference of the majority. Economists have long taught this history to their undergraduates as an illustration of the growth theory for which Robert Solow won his Nobel Prize in economics: Poor places are short on the capital that would make local labor more productive. Investors move capital to those poor places, hoping to capture some of the increased productivity as higher returns. Productivity gradually equalizes across the country, and wages follow. When capital can move freely, the poorer a place is to start with, the faster it grows. "That's one of the central relationships in macroeconomics," says Daniel Shoag, an economist at Harvard University's Kennedy School of Government. "It's an extremely strong one, and we teach it in introductory macro because it's one of the few macro facts that are predicted by a model that isn't a tautology and that holds extremely well." Or at least it used to. Over the past 30 years, the convergence has largely stopped. Incomes in the poorer states are no longer catching up to incomes in rich states. But migration patterns changed after 1980. "Instead of moving to rich places, like San Francisco or New York or Boston, the population growth is happening in mid-range places like Phoenix or Florida," Shoag says. Lower-skilled people, defined as those with less than 16 years of education, are actually moving away from high-income states. The problem isn't that they can't find "good-paying" jobs. Even people without college degrees still make more in high- income states. But that money buys less than it would elsewhere. The high cost of housing more than eats up the extra earnings a mechanic, medical-billing clerk or hairdresser can make in a place such as New York or Los Angeles. More-educated people also pay more to live in such cities, but their higher salaries mean that housing costs consume a smaller percentage of their income. They still come out ahead. "My brother-in-law is a waiter," Shoag says, "and he could earn a lot more money being a waiter in Boston than he could in Ohio. But it's so expensive here that it doesn't make sense to move to Boston if you're going to do a job that doesn't require a degree." Housing prices have always been steeper in high-income places, but the difference is much greater than it used to be. In their paper, the economists set out to measure the cause of the change. They create an index of regulation based on how often the phrase "land use" occurs in state appellate court cases over time. This proxy turns out to predict housing prices well. It also closely matches results from surveys of regulation from 1975 and 2005, suggesting that it's picking up real changes in the legal environment, not merely word choice. The news isn't all bad. Less-educated workers may not have the opportunities they once had in places such as California and New York, but they can still raise their real incomes, factoring in housing costs, by migrating to states like Nevada, Florida and Texas. "Places that didn't have this increase in regulation still have the old process that worked," Shoag says, "where people move to the richer areas, human capital levels converge, incomes converge -- the whole chain that used to exist for the whole country is still true if you focus just on the areas that haven't had as large an increase in regulation." As I have argued elsewhere, there are two competing models of successful American cities. One encourages a growing population, fosters a middle-class, family-centered lifestyle, and liberally permits new housing. It used to be the norm nationally, and it still predominates in the South and Southwest. The other favors long-term residents, attracts highly productive, work-driven people, focuses on aesthetic amenities, and makes it difficult to build. It prevails on the West Coast, in the Northeast and in picturesque cities such as Boulder, Colorado and Santa Fe, New Mexico. The first model spurs income convergence, the second spurs economic segregation. Both create cities that people find desirable to live in, but they attract different sorts of residents. This segregation has social and political consequences, as it shapes perceptions -- and misperceptions -- of one's fellow citizens and "normal" American life. It also has direct and indirect economic effects. "It's a definite productivity loss," Shoag says. "If there weren't restrictions and you could build everywhere, it would be productive for people to move. You do make more as a waiter in LA than you do in Ohio. Preventing people from having that opportunity to move to these high-income places, making it so expensive to live there, is a loss." That's true not only for less-educated workers but for lower earners of all sorts, including the artists and writers who traditionally made places like New York, Los Angeles and Santa Fe cultural centers. In their paper, Shoag and Ganong don't look at why high-income states tightened their regulations, thereby increasing segregation by education level. One possible explanation is that as people get richer and cities get more crowded, the tradeoffs between cheaper housing for newcomers and a pleasant (or at least stable) environment for current residents look different. When postwar developers were turning California orange orchards into suburbs, residents focused on the new houses rather than the lost landscape. Now opposition to new construction is not only common but institutionalized. Well-organized residents fear losing the amenities that attracted them in the first place. Another consideration is the difference between housing as consumption -- a nice place to live -- and housing as an investment, promising high returns over time. Making it hard to build new housing in a place people want to live drives up the price of the existing housing stock. Old-timers reap capital gains. Regulation, Shoag notes, "takes what should be the gain for the worker who wants to move in and turns it into the gain for the owner of the house." Finally, there's the never-mentioned possibility: that the best-educated, most-affluent, most politically influential Americans like this result. They may wring their hands over inequality, but in everyday life they see segregation as a feature, not a bug. It keeps out fat people with bad taste. Paul Krugman may wax nostalgic about a childhood spent in the suburbs where plumbers and middle managers lived side by side. But I doubt that many of his fervent fans would really want to live there. If so, they might try Texas. By far the most important step that can be taken to enhance opportunity is strengthening public education. ... Over the past 40 years, with the strong support of the federal government, the nation's leading universities have made a major effort to recruit, admit, support and graduate minority students. These efforts will and should continue. But as things stand, a minority youth with strong test scores is considerably more likely to apply and be admitted to a top school than a low-income student. The leading U.S. institutions must make the kind of focused commitment to economic diversity that they have long mounted toward racial diversity. It is unrealistic to expect that schools that depend on charitable contributions will not be attentive to offspring of their supporters. Perhaps though, the custom could be established that for each "legacy slot" room would be made for one "opportunity slot." What about the perpetuation of privilege? Parents always seek to help their children. But there is no reason the estate tax should decrease relative to the economy at a time when great fortunes are increasingly dominant. Nor should we continue to permit tax-planning techniques that are de facto tax cuts only for those with millions of dollars of income and tens of millions in wealth. These are just a few ideas for advancing equality of opportunity. There are many more. It is an aspiration those of every political stripe should share. "Both sides make good points. While I support moves to make the tax system more progressive, the reality is that inequality is likely to continue to rise, even with all that can responsibly be done to increase tax burdens on those with high incomes and redistribute the proceeds. Measures such as allowing unions to organize without undue reprisals and enhancing shareholders' role in setting executive pay are desirable. But they are unlikely to even hold at bay the trend toward increasing inequality." Typical VSP rhetoric. The other side has no points, good or otherwise. And there is no reason to think that more progressive taxation, stronger unions and higher minimum wages could not make a dent in inequality, as it has proven track record of success. "Where does this leave the public policy agenda? The global track record of populist policies motivated by inequality concerns is hardly encouraging. However, passivity in the face of dramatic economic change is equally unlikely to be viable. Perhaps the debate and policy focus needs to shift from inequality in outcomes, where attitudes divide sharply and there are limits to what can be done, to inequalities in opportunity. It is hard to see who could disagree with the aspiration to equalize opportunity, or fail to recognize the manifest inequalities in opportunity today." And in the case of inequality it is essential. We need both more equality of outcomes and equality of opportunity as they are certainly interrelated. Most of the inequality in the US today relates to the maldistribution of income and wealth towards the 1% and that is certainly not due to their vastly superior education. So improved educational quality hardly even begins to address its main cause. Who could disagree with it? The Republicans of course. haven't they been pushing for cuts to Pell grants ever since they regained control of the House? Don't be naive. Outlawing the intergenerational transfer of wealth and redistribution of the confiscated wealth to a single age-cohort each year, say at the age of 21, coupled with free eduction to the level that a person is able to take advantage of it would be perhaps the most rapid way to turn the U.S. into a meritocracy and to ensure that any wealth gap is based on achievement and luck and not on inheritance of advantages. Well, if you want to go that route, you might as will throw in free unicorns all round. However, raising estate, gift and wealth taxes is not a bad idea. After all, it's been done before. @fgbouman: "the most rapid way to turn the U.S. into a meritocracy"
"Meritocracy" is by now, at least in the US, a BS term, and the elites call for "education" to serve as a counter to inequality is another line of BS. At this point "education" is largely serving to perpetuate inequality. Educational outcomes are largely determined by socioeconomic factors, not school, a fact that has been true at least since CHristopher Jencks's 1972 book about the topic. And your suggestion about outlawing inheritance is absurd. What utter nonsense. Summers is concerned with being admitted to a top school. Sheesh..... Only 1/3 of 26 yr old population gets a bachelor's degree or better. This rate has been pretty flat since the mid-70s. And, it one of the highest rates in the world (i.e. Germany is about 18%). We need to figure a way to identify poor people so they stand out in public. That way the schools that admit them can get the benefits of visibly supporting opportunity. They have no incentive to do that if you can't tell a poor kid from a rich kid. Maybe armbands. Yellow armbands with some identifying marker. Maybe a star would work. Yeah, that's it: a yellow armband with a star on it so the schools can show the world they're behind opportunity. Golly, it's pretty darn easy to find something more salient than education. "By far the most important step that can be taken to enhance opportunity" is, for instance, to define a real living/minimum wage. Think of the freedom in that: business can hire anyone they want for any job they want but they must pay at least the living wage. Minimal job-killing regulation, all you have to do is meet the pay hurdle. People who are well-fed, well clothed, well-housed, happy about their lives and their country, will find lots of opportunity. The guys who promote education are really saying you're in trouble because it's you own fault you're not smart enough. End that. Define all jobs to be good jobs. Letting bureaucrats define the job market is a really really bad idea. Would you leave it to the corporations? Labor and better wages need support and that support could effectively come from the govt... in an ideal world, but alas, we live in the US, not an ideal place for labor. Yes, I think we should pass a law requires everyone to be happy. Then they will work hard, be self-motivated, and become contributing members to society! Golly gee, why didn't I think of that, Mr. Folksy? What business is going to hire a guy with little or no skills for $15 an hour for a job where their marginal production is only at $8 an hour? Because the government is going to subsidize them? How long can that situation possibly continue? There actually are a lot of people that really aren't smart enough. 50% of people are still dumber than average. Umm, see the thing is you take their "marginal production is only at $8 an hour" and make it $15 an hour. Then every business has to raise thier prices to account for that minimum standard. So competition is not hurt, and the priice increases are minimal for the public, and they receive in turn a society that is not rapidly developing a serf class. Proof of the price rises due to such follows. Of course, not every business is the same, but most are. You have to think a little deeper... Think about a job that has a marginal product of $8. It is a job that pays below what anyone's time is worth to cover private and social costs for living... and in Hawaii, if the job goes over 20 hours per week, you have to pay health insurance for the employee. I have a neighbor who cleans houses. She charges about $40/hour and pays her help $12/hour. So if she charges the customer $80 for 2 hours of work, and pays out $12 for her employee (cash by the way), she just earned $68/hour for hour of work. She pays out $12/hour because she thinks she is being generous by paying over the minimum of $8/hour. She has no clue what her marginal product is or that the employee has private and social costs. She just pays what help is paid by society. Pay has dropped that low by standard because labor has no power to negotiate up the low wages. If you find a job with a marginal product of $8, I bet that the employer is driving down their labor costs to $8/hour, just to pay that amount, but that actually the marginal product is higher. If you look deeper still, if the govt raises the minimum wage above $10/hour, that job of $8 marginal product will be unprofitable. What happens over time? Jobs are developed that have higher marginal rates of labor. This is healthier for society to cover social costs through wages instead of govt transfers. Also, make an analogy to cheap investments in China. For years, money has been cheap and subsidized there. They over invested and now many of those investments are leading to high social costs for society. Society will end up paying for bad investments. "The guys who promote education are really saying you're in trouble because it's you own fault you're not smart enough." 'We' have no intention of furthering opportunity, by education or any other means. 'We' would like to privatize education so that only the swells could afford one (doing pretty well with this one, we are). Privatizing student loans with taxpayer backing was another coup. Gotta love the blaming of teachers for the problem of culture, politics, and economics; ah, sweet, sweet diversion. Getting lots of people to believe that if everyone had a good education they would somehow all find good jobs is one of my personal favorites. Any hope of lifting the veil and taking a peek at the new reality? This nostalgia for a time that may or may not have ever been is going to kill us all. Looking back at my parents' generation, the real leveler was job opportunity. Not everyone had equal outcomes, but anyone who wanted a job could find one. We need to fix this dysfunctional economy. More than stimulus or tax cuts. Suggestions anyone? Ask yourself who is marginalized in the economy... it is those with low real wages by historical standards. The goal is to widen the margin to widen your room for growth... Thus, wages have to start rising in the lower incomes. > Living wages. and according to the employment-led model, raising wages now would lead to more employment, and more aggregate demand. Summers is apparently using this as a safe political toehold in order to get something on the record about inequality until the election is over. It's safe for three reasons. It applies only for the long run, it functions entirely from the supply side and it sends the message that education for the privileged need not necessarily be superior than public education is for anyone (including the privileged) to equalize opportunity. That's plenty to fuel the political media cycles and duck the real reason, that equalizing opportunities can't work until unequal outcomes are based on performance, not the specialized occupations of economic rent recovery that it has become. Summers ignores the huge Catch-22 in the equation. No amount of pumping up qualifications on the supply side is going to change the number of slots on the demand side nor their distribution of unequal outcomes not based on performance. For example there will still be only one Citigroup and only one slot held by his former boss Robert Rubin to rake in tens of millions of unearned compensation regardless of how many better educated candidates are available to "compete" for such positions based on "performance". You are right that we need to pump up Demand. But Demand is also dependent, in a way, upon education. It takes some pretty smart engineers to think up and create an iPad and a just as smart a consumer to want to buy one. Education can indeed bring an enhancement in Demand in terms of value-added in the US - despite the fact that most of these "gadgets" are manufactured in the Far East. It is entirely possible that development and distribution costs account for far more of the retail value than the components and manufacturing. Both development and distribution are highly head-count dependent. And the personnel involved are not numskulls. Besides, America is a nation with quick uptake of new technologies. Even if they are rudimentary "gadgets" or "games". An even more basic issue is why the advertising and marketing of prescription drugs is allowed at all, when consumers can't buy them and shouldn't be influencing doctor's decisio good reason why doctors should be allowed to accept any perks at all from [drug] companies... It's an inherent conflict of interest. Codes of ethics that are supposed to limit such gifts obviously don't work. All perks should be banned, and doctors that accept them should be subject to potential loss of their license to practice. There is renewed interest in the issue of onshore outsourcing or subcontracting as we evaluate the societal implications of the private equity model exemplified by Bain Capital. Yes, that would be the Bain Capital that is the main source of earned income for candidate Romney. Writing on this topic, Paul Krugman recently reported some relevant findings from my research in his blog as well as his column. I thought it would be useful to share some more details from that research that was jointly conducted with Ethan Kaplan. Over the past 3 decades, a rising share of work that used to be done "in-house" has been outsourced to outside contractors. Sometimes, the exact same work is being done at the same physical location-but by someone with a different employer of record. So what is the point of re-labeling people as outsourced workers as opposed to in-house employees? After all, a janitor cleaning the floor of your building after work hours is doing the same job whether they wear a uniform with a contractor logo or that of your company. Yet, we have seen companies spin off work that is outside of their "core competencies" to such outside contractors. While the idea of "core competency" makes us think of knowledge and efficiency, it is also plausible that the primary motivation for companies is to spin off low-wage work to contractors who could-and would-pay lower wages and benefits. In our research, we specifically considered two occupations where the contracting status was easy to identify using the data: security guards and janitors. These two occupations also saw extensive contracting out during the 1980s and 1990s. We found that subcontracted employees earned lower compensation than their in-house counterparts (between 7 and 12 percent for janitors and 13 and 26 percent for security guards depending on the specification). The evidence for wage reduction held even as we considered individuals within the same occupation switching jobs between in-house and outsourced varieties. Interestingly, we found that the main impact of outsourcing was to reduce "good jobs" within these occupations: janitors and security guards in the upper half of their respective wage distributions saw substantial reduction in wages due to outsourcing. The pictures below shows the actual occupational wage distributions in 1983 and 2000, as well as "counterfactual" ones had the level of outsourcing remained constant. The story that these pictures tell is one where good in-house janitorial and security jobs were replaced with worse subcontracted jobs: the top quartile of these service jobs saw the greatest reduction in wages (typically above 15%) due to the growth in outsourcing. Finally, we found that industries and areas that were outsourcing tended to be those who historically paid better wages and benefits. This is exactly the pattern you would expect if companies outsourced primarily to cut pay for these workers-for instance to break previous implicit contracts without upsetting their "core" workforce or changing company wages and benefit norms. There were many factors behind the fall in the wages of low-credentialed workers during the 1980s and 1990s. Our research suggests that one of those factors was change in institutional arrangements-such as outsourcing-which further reduced the bargaining position of workers in low-wage occupations. To the extent that companies were rescued-and profits restored-by breaking implicit contracts on wages and benefits, we should rightfully be wary of the societal value of such practices. Less than 20 percent of American households earn more than $100,000. Health-care costs have gone up more than 134 percent from 2000 to 2011. Median incomes rose 19.9 percent from 2001 to 2011. One hundred thousand dollars. Since the 1980s, the magical "six-figure" salary has been a benchmark for financial success. Not too long ago, that income often meant two nice cars in the garage of a large house, fun family vacations and plenty of money left over to save for retirement and college tuition. But times have changed. Not only has standard inflation steadily eroded the real value of a $100,000 income, but the cost, of housing, health insurance and college tuition have risen dramatically in recent years. Consider the rising costs of food, energy and the necessities of a middle class life, and that six-figure luxury quickly turns to six-figure mediocrity. Less than 20 percent of American households even break the six figures. But many who earn incomes near the mark find that their prized incomes don't take them as far as the hype. Many say that while breaking the $100,000 annual income mark may still be an impressive milestone, it doesn't exactly roll out the red carpet. According to the U.S. Census Bureau, only 6.03 percent of individual over 18 and only 19.9 percent of households had incomes of $100,000 or more in 2010. In fact, the median annual household income for 2010 was $50,046, just more than half of the six-figure benchmark. The overwhelming majority of Americans still look up to a $100,000 income, but the expectations of what comes with that income are rapidly slumping. According to Labor Department statistics, the average inflation rate for 2011 was the worst since 2008, with consumer prices rising 3.1 percent, compared to an average of 1.6 percent in 2010. Much of this was fueled by energy costs (up 15.2 percent for the year) and food costs (up 3.7 percent for the year). Just to keep up with standard inflation, a $100,000 salary in 1990 would have to be $172,103.29 in 2011. "What would have cost you $100,000 in 1976 would cost you $381,000 today. That's just the inflation, and there are so many other things that have grown very expensive," says Mari Adam, Certified Financial Planner and president of Adam Financial Associates in Boca Raton, Fla. The small communities that dot the picturesque mountain landscape outside Boulder, Colo., conjure up an image from long before the great recession. Here the manicured lawns and expensive cars are a testament to the achievements of a fiercely independent and educated middle class; a 21st century version of suburban bliss. But often these days, the closed doors of well-kept houses hide a decidedly different reality: hushed conversation about food stamps and Medicaid, depleted bank accounts and 401K's, kitchen shelves stocked with groceries from food pantries. FP: What evidence is there that inequality in the U.S. has gotten worse? EL: There's a lot of evidence, and there's a shrinking school of people denying this evidence. The most powerful piece is also the most recent, and that is the distribution of growth since 2009. The paper by Saez and Piketty from Berkeley University that came out in early March is particularly instructive. It shows not only that 93 percent of the gains in the 3 percent growth America got that year went to the top 1 percent, but also that the top 0.01 percent, namely the top 15,600 families, took 37 percent of the growth. That's the top one in 10,000 people. Even in 2002-2007 inequality was getting much worse. But in this recovery it is an order of magnitude worse. FP: Hasn't social mobility also declined? EL: It's a triple cocktail. As America's inequality is growing to Latin American levels, social mobility has fallen to sub-European levels. And of course, median wage stagnation and the whole skills globalization problem is deeply entrenched. Far more important than whatever this month's consumer sentiment number is or last month's was -- these are the numbers we should be looking at. FP: So historically we are declining relative to other powers. Clearly something big is changing the global economy. Domestically inequality is growing, social mobility is declining, median wages are falling, and core industries like manufacturing are shrinking. And yet, when you listen to politicians, the response is first, in the wake of crisis, we need a stimulus that'll make things go back to the way they were. Then politicians argue that we should go back to manufacturing as it was in the past and somehow wave a magic wand that will make it 1955 again with Cadillacs with big fins rolling out of factories. In the course of your reporting, did you find anybody who's coming up with a new approach? Or is the reason for your pessimism due to the fact that we are oblivious and inclined to apply old formulas to address new problems? EL: I think it is inevitable in life that the No. 1 country, having been number one for so long, will be the most complacent. In addition, America has so many examples to draw upon of being in a tough spot and pulling out of it, so it's understandable that it has been the slowest to adapt intellectually to the challenges posed by the changing global economy. America is adapting even slower than Britain, in some respects, which might be doing the wrong thing but is at least in a panic and knows it's got to find new answers. FP: Has that been turned around on its head? EL: Yeah. Britain, which is the least socially mobile portion of Europe, has the same level of social mobility as the United States. Some countries like Germany have more than twice America's social mobility. Tocqueville would have looked at statistics -- and how accepted this reality is now becoming among America's elites. Among economists, it's all about returns and skills. And apparently, if you make X million on Wall Street, this is because you're worth it. This is how valuable you are. Now I can understand it with Steve Jobs. I can understand it with plenty of entrepreneurs. But it's hard though in the financial sector to extend that logic. Having said that, I think if you took a poll you would find great approval of Steve Jobs and great disapproval of the Wall Street bonuses. Public sensibility does make a very clear division on that. I do understand that distinction, because Steve Jobs was a genuine innovator. And I agree with Paul Volcker that the ATM is about the only innovation you can cite from Wall Street. It was a good innovation, but let's not classify derivatives and various pieces of financial engineering as innovations. FP: The other point is pragmatism. Do the Americans today have the spirit necessary to tackle these problems? EL: I think there's demand for it. Americans might be ignorant about the Middle East or Europe, but they're certainly aware of their own situation. They are certainly aware of the problems here. And I think, as [GE CEO] Jeff Immelt said, if globalization were put to a referendum in America, it would lose -- which is troubling, and it's one measure of the degree of alarm and distemper felt out there, which I come across the whole time whenever I'm outside of the Beltway. The question of whether that pragmatic instinct that Tocqueville best described is now missing is more a question about whether the market signals are working in American politics anymore. Because the consumers want some kind of change; they want some kind of recognition of the degree of pain and strain they feel nowadays in their lives, to which they are not accustomed. The system seems unable to respond. Democracy is a market as well, and it doesn't seem to be working. So the question is what stops democracy from being a market in America? To answer that we go back to the world of money in politics; we go back to the world of Latin Americanization of American society; we go back to some of the institutional factors like gerrymandering. But we also go back again to the American people, to the consumers. Could this be a form of 'Social cleansing' without the need of war or disease inflicted by the orchestrators - simply a controlled bout of poverty? Or is this the forced education that only condition children to know only a certain amount of knowledge that can only ever see them progress in working environments such as confined offices within the 'Human Zoo' qualities within the desperately overcrowded cities. I went through the Federal Reserve's Quarterly Release on Household Debt and Credit released today, and there were two notable trends. One is that the amount of consumer debt is declining, but that delinquency rates are stabilizing above what they were before the crisis. 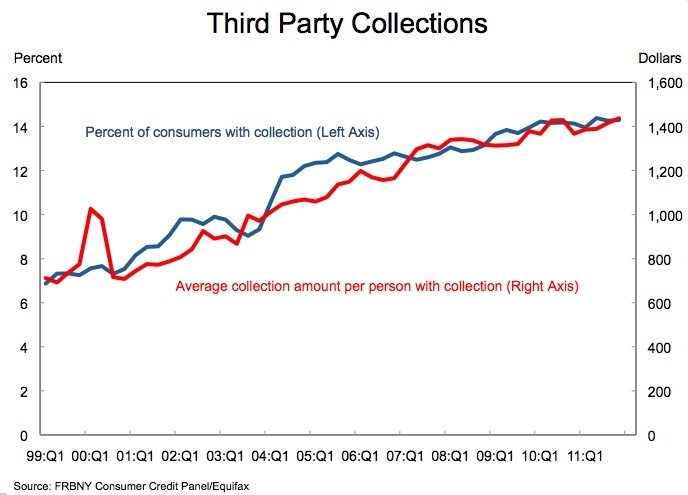 And the second is in this graph, which is that the number of people subject to third party collections has doubled since 2000, from a little less than 7% to a little over 14% of consumers. 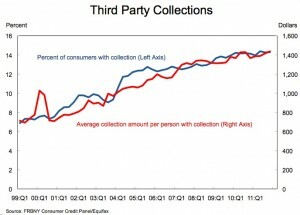 Ten years ago, one in fourteen American consumers were pursued by debt collectors. Today it's one in seven. There are now thousands of people legally jailed because they aren't paying their bills, ie. debtor's prisons have returned. Occasionally elites let it slip that this is not an accident, but is their goal – former Comptroller General David Walker has wistfully pined for debtor's prisons overtly (on CNBC, no less). This may be somewhat mediated by government action, as the CFPB is beginning to make noise around debt collection and credit ratings, and Illinois Attorney General Lisa Madigan is working to stop debt-related arrest warrants. But only somewhat, only where the government can protect you and only when there is the political will to do so. Increasingly, creditors are coming to set up the institutional structures for financial surveillance, state-sponsored enforcement of their claims through tightened bankruptcy laws and the selective use of jail, and the denial of economic opportunity based on one's interaction with the financial system. Again, ten years ago, one in fourteen Americans were pursued by debt collectors. Today it's one in seven. I suspect this number will keep going up. And though debt collection is a highly competitive field, it's also a growth industry. [Feb 12, 2012] "Mean-Spirited, Bad Economics"
Mean-Spirited, Bad Economics, by Simon Johnson, The Baseline Scenario: The principle behind unemployment insurance is simple. Since the 1930s, employers ... have paid insurance premiums ... to the government. If people are laid off through no fault of their own, they can claim this insurance – just like you file a claim on your homeowner's or renter's policy if your home burns down. Fire insurance is mostly sold by the private sector; unemployment insurance is "sold" by the government – because the private sector never performed this role adequately. The original legislative intent, reaffirmed over the years, is clear: Help people to help themselves in the face of shocks beyond their control. But the severity and depth of our current recession raise an issue on a scale that we have literally not had to confront since the 1930s. What should we do when large numbers of people run out of standard unemployment benefits ... but still cannot find a job? At the moment, the federal government steps in to provide extended benefits. The recent attempt to portray the unemployed as lazy, TV watching, video game playing, frauds living off the benevolence of the government when they could be working is part of the effort of those who have managed to do well even though we've had a recession to avoid paying to help those who have been less fortunate. We will always be able to find people doing their best to take advantage of just about any program that helps people, but making a big deal out of those exceptions does not change the fact that the vast majority of the unemployed are just like the rest of us, just not quite as lucky. Whre's our compassion? "Many tout the U.S. as the Roman empire of the modern world. But as it turns out, that comparison may not be all good. The findings add to the growing chorus of studies and criticisms indicating that the wealth gap is hitting truly remarkable levels. The top one percent saw their incomes rise by 275 percent between 1979 and 2007, according to the Congressional Budget Office, while the bottom fifth of earners only saw their incomes grow by 20 percent during that same period. In addition, the total net worth of the bottom 60 percent of Americans is less than that of the Forbes 400 richest Americans. Perhaps even more shocking, the six heirs to the retail giant Walmart had the same net worth in 2007 as the bottom 30 percent of Americans..."